Mark Hamill wants you to open your toys and play with them. Here's a paper bag to breathe into, I can hear you hyperventilating. Back in the 1990s I worked in the collectible toy business as a store owner and magazine writer. I was responsible for creating or editing many of the toy price guides that were out in the world, and there was always one rule: Don't open the package as it will destroy the value. Well, Luke Skywalker himself doesn't subscribe to that concept. Speaking on Friday at the opening of Star Wars Celebration Europe, Mark Hamill addressed one of the oldest legends related to himself that he received every Star Wars product made in the early days. "When we were doing the [original] movie, I was reading this thing and thinking, 'It reads like a toybox!' There are floating cars, there are fire-swords, and robots," Hamill said. "So I said to George [Lucas], 'Can I get on a list where I get one of everything?' And he said, 'Sure.' I thought there'd be a poster, there'll be a comic book, and a t-shirt maybe or a record album." Little did the actor know how much merchandise there would be. "The toys just start coming to your house. Bum-bah-bump, bah-bump…," Hamill sang. "Every day, more toys." With such an onslaught of toys you, would think he would have a room full of pristine original Star Wars toys worth a small fortune, but it seems he took a different approach. "I gave all those toys to the kids, and they grew up later and said, 'Oh my God, Princess Leia in the box is $1,400 in mint condition! Why'd you let us give her a Sinead O'Connor haircut with cuticle scissors?' I said, 'They were your toys!'" As I said earlier, I once subscribed to the leave everything in its package school of thought, but then I realized there was only so much fun staring at them. Toys are meant to be played with and enjoyed, and now every toy I buy is opened and displayed in some way. 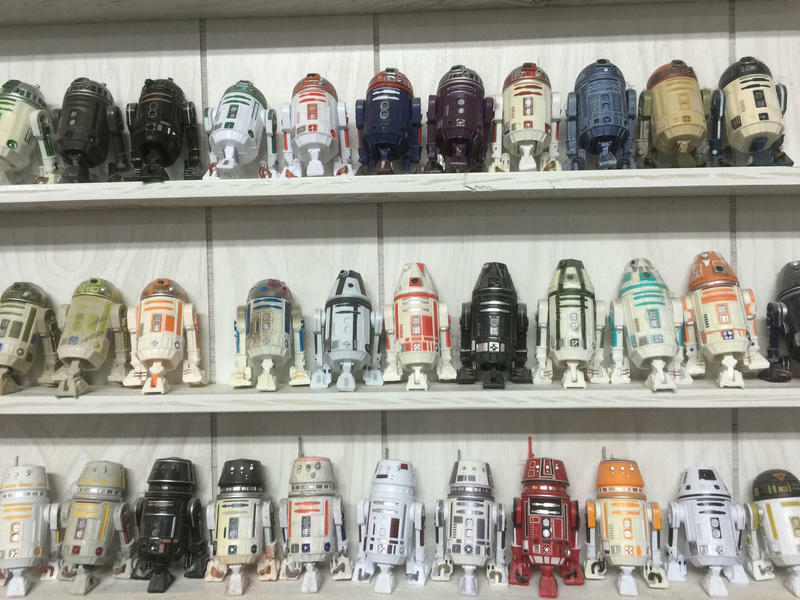 The picture at the head of this post of all those astromechs? That's a display that is on the wall above my desk in my office. What can I say… I love astromechs. So, next time you walk down a toy aisle and think about buying a toy to just put away in a box, never to be opened, just ask yourself, "What would Luke Skywalker want me to do?" Yeah, he'd totally want you to open it and play with the toy.